I have issued a challenge to Harvard Business School Professor Eugene Soltes. I will meet him in Cambridge (or anywhere) to debate his book: “Why They Do It: Inside the Mind of the White-Collar Criminal.” He can question me about my white-collar crime and ministry, and I can question him about his ethics in researching and writing his book. I hope you will attend if he accepts? This is a rallying cry against shame, stigma, and sensationalism and for criminal justice reform, compassion, empathy – and journalistic integrity. Please join me in this challenge in your comments to this blog post or by email. As the Director of the first ministry in the U.S. created to support individuals and families with white-collar and nonviolent incarceration issues, and as someone who served time in a Federal prison for a white-collar crime I committed when I was a lawyer, I can state unequivocally that Professor Soltes’s methodology and his conclusions are “pure rubbish.” Why They Do It, and the press releases and media attention surrounding it, are shamelessly exploitive and are designed solely to sell books; they inflame bigotry and hatred and paint people with a broad brush designed to promote stigma, shunning and Schadenfreude (unfortunately, themes for our time it seems). I am sure if we re-interviewed his subjects, most or all would say they had been duped into letting down their guards in sharing intensely personal details of their lives and feelings on the promise and belief that Soltes’s book would be fair and balanced. If indeed he disclosed to them that he was writing a book at all? We have worked with hundreds of men, women and families involved in and suffering from these matters, and most are not the subjects of the sensationalized headlines that Soltes claims to have interviewed. In fact, the overwhelming majority are ordinary people, professionals who live down the street, whose children play with yours, who simply got in over their heads due to desperation, addiction, compulsion or mental illness. Most didn’t have the ego strength to simply talk to their spouses and admit that life was not going the way they had hoped and dreamed, until they had stepped over the line and it was too late. Contrary to Soltes’s core thesis statement, most have been mired in shame, guilt and remorse even before they were caught. It is terrifying and exhausting to spend their lives looking over their shoulders knowing that they‘ve done something that far wrong. Whether they aware of it or not, almost all go through some kind of transformation from a material life to a more spiritual one. What other choice do they (we) have? Although I probably have “interviewed” 4 or 5 times as many people accused or convicted of white-collar crimes and their families, I’m not arrogant enough to assert that I understand “why” anyone did or does anything. But then again, I didn’t write a book claiming I do. Note the clever, and frightening, [person change in] the title of the Professor’s book: why THEY do it: inside the mind of THE white-collar criminal! Aren’t we a society that has fought against, and protected people from, this sort of propaganda that aggregates and assigns characteristics to an entire class of people in order to marginalize them and promote fear of them? Our society has evolved enough that mass incarceration and related topics are now dinner-table conversation; they are finally part of the national debate. I am glad that we give many violent criminals a second chance, and indeed all of God’s children deserves our empathy, compassion and kindness. 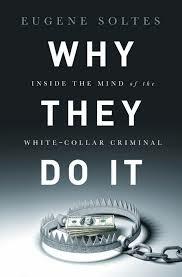 But white-collar criminals have little such chance, largely because of the kind of book written by Professor Soltes. Bob Russel (CIPA 08) Hi There; In both my personal & professional opinion it appears to be two completely different points of view on this matter. I am both a Christian and member of the Church Council on Justice & Corrections. Secondly, I have training & experience in corrections, policing, Crime Stoppers mental health assessments & addictions. Therefore I can see both sides on this matter. Appears this topic needs to be resolved in both a frank, open & honest debate between these two people here. There are always two sides to a story and this matter needs to be decided in an open forum and allow people to make up their own minds on this very topic here!!!! Thank you very much. Tom Walker Well, I, for one, am working hard to get more white collar criminals into jail so they can find the spiritual help they need. Kevin Lewis, CFE This critique does not debunk Soltes’findings about why white collar criminals commit fraud. The only critique I saw was that they believed the wrongdoers were remorseful and went through a transformation while incarcerated. I hope this is true as it would mean that the penal system works. The information Soltes found as to why people commit fraud is consistent with the earlier work of Edwin Sutherland and Donald Cressey so it should not be discarded. Kathy Morse Shame, an overwhelming sense of guilt almost to the point of drowning in it, being paralyzed by it…. yet we somehow manage to take that life altering experience and make it our life’s mission to fight for reform, for a right and just criminal justice system, if there is such a thing. To advocate for those we left behind because for someone who has experienced it, those voices, those images, those events are forever seared in our brain, memories that we cannot rid ourselves of. It’s taking a negative, painful part of life and making it into the most positive learning experience in life. Layne Pavey I think this issue should be researched more. I can certainly consider myself a perpetrator of this kind of crime, for which I served a federal sentence, but I’m not sure I put myself in this stigmatized category of “greedy, white banker.” The population representing money crimes should be qualitatively studied, but only to find solutions and interventions. Not to exploit the desperation of those who were in tough places and had to make tough choices. Especially when people do admit they were bad choices and learn from their mistakes. Lisa Mayes Lawler Jeff I respect and appreciate your apology to Prof. Soltes. IMO social media has made reacting without digesting and reflecting all too easy. When we have a strong reaction to something there is a reason, or many reasons, and we must examine all sides of what caused that reaction and why. I would openly support both sides of the debate to see if some common ground might be shared. Beth Corso I also would like to speak with Professor Soltes as in a pre-release interview, he was asked if the white collar criminals felt any remorse for his “victims”. Professor Soltes responded that there was little remorse felt as the criminals felt so far removed from their victims. My strong response to Professor Soltes and any white collar criminal – THE VERY FIRST VICTIM IN YOUR CRIME IS YOUR FAMILY. Dan Varley Great to see the principles of revovery in action!